Each year the Salle conducts seven tournaments for its members, providing in-house competition for both its competitive and recreational fencers throughout the year. With the exception of Fence Til You Drop, tournaments normally are conducted over an extended time period to allow fencers to complete their bouts during open fencing and class periods. Fencers should read the rules for each event carefully, as the administrative rules for each tournament are different, and in most cases differ in one or more ways from standard USA Fencing Tournaments. Each tournament is designed to meet a specific training goal or to encourage specific approaches to the bout. Winners of Salle competitions receive either medals or ribbons to recognize their achievement, with the exception of the Point Champion and the Iron Men, who receive individual trophies, and the weapons squad winning the Walpurgis Cup, a permanent trophy. All winners of the Salle Championships are recognized on the Salle Championship permanent plaque. points = (number of fencers – place achieved) + 1. USA Fencing National Events: Championships, Summer Nationals, North American Cups, Junior Olympics. Youth Circuit events: Super Youth Circuit and Regional Youth Circuit. Division sanctioned tournaments: Virginia Division and other Divisions. Salle Green Annual Tournaments: Fence Til You Drop, Spring Relays, Salle Championships (individual and team), August Chase, Anniversary Tournament, and annual Ladder tournament. Each fencing year the fencer having the highest cumulative total of points for these events is declared the Salle’s Point Champion. SA02. Walpurgis Cup: The Salle weapons squad with the greatest number of bouts fenced in Salle Ladder competition (minus the number of fencers in the weapons squad who do not actively fence on the Ladder) is awarded the Walpurgis Cup annually at the end of the fencing year. SA03. Iron Man: The Salle member who fences the most practice bouts (including pool, direct elimination, and team) and the Salle member who fences the most Ladder bouts during the fencing year are declared the Salle Iron Men. Go1. All tournaments are currently fenced dry (without the use of electrical scoring equipment) to maximize the number of bouts that can be fenced in our normal class and open fencing periods. We prefer fencers not use electric foils or epees to preserve a level playing field. Go2. All bouts are fenced on the old Amateur Fencers League of America 32 foot strip, otherwise under current USA Fencing rules. Classical Foil bouts are fenced under Classical Academy of Arms classical rules on the 20 foot strip. Go3. Fence Til You Drop is fenced without referees. Fencers in all other events may either request a club member serve as referee or may agree upon the results between themselves. Fencers are honor bound to acknowledge all hits. Go4. Each tournament has its own distinctive organizational rules. Participants are responsible for having read the rules and for complying with them. Fo1. Fence Til You Drop is a three weapon tournament fenced from 11:00 am to 1:10 pm on January 1st of each year. Fo2. Competitors are expected to have read the rules – a separate competitors briefing will not be held. Fo3. Weapons eligible to be fenced include foil, epee, and sabre. Fo4. The event runs for 2 hours by the clock, with a 10 minute break at approximately the half-way point. Fencing starts exactly at 11:00 am. Fo5. All bouts are 5 touch bouts. A special Fence Til You Drop score sheet will be used. Fo6. Fencers are expected to fence whoever challenges them in whatever weapon is mutually agreeable. Fencers may not monopolize one strip and one opponent, but must fence a variety of opponents, returning to the scoring table each time a bout is complete to enter the results on the score sheet. Fencers may fence as many or as few bouts in any weapon as they desire. Fo7. Fencers may fence the entire two hour period, may take breaks, or enter late or finish early, all with no effect on their standing in the event. Fo8. The winner is the fencer who fences the most bouts, win or lose. In the event of a tie in any place, placing will be determined by, in order: (1) bouts won, (2) indicators, (3) touches scored. Fencers are honor bound to attempt to win their bouts, and not simply be targets. Fo9. 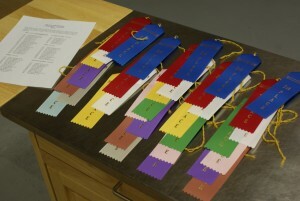 Medals are awarded for places first through third with ribbons for places 4th through 10th. Lo1. The Ladder Tournament is conducted throughout the fencing year, starting on 1 August of each year and ending on 31 July of the subsequent year. Fencers may enter the Ladder Tournament at any time during the competition. Lo2. Weapons eligible to be fenced include foil, classical foil, 1 touch epee, epee, lancet epee, and sabre. Fencers enter to fence a specific weapon, and may enter as many or as few weapons as they desire. Lo3. The Ladder is administered online at Free Online Leagues. Fencers may challenge any fencer above them on the Ladder, and fence Ladder bouts during Open Fencing or during the practice fencing periods of any class. Fencers are responsible for agreeing which fencer will enter the results of the bout, and for entering those results in a timely manner. Lo4. The Ladder rank orders fencers based on their ability to defeat fencers above them on the Ladder. A Ladder victory against a higher ranked fencer results in the victor taking the place of the defeated, and the defeated moving down one space on the Ladder. Lo5. Fencers who do not fence bouts regularly are automatically demoted one place on a schedule established on the Ladder website. Lo6. Fencers who enter but do not fence a bout during the year are not counted for determining placing on the ladder. Lo7. Medals are awarded for places first through third in each weapon, as of the end of the last class in the Salle on the last day of the fencing year. Fencers must fence at least 15 bouts to be eligible to receive a medal in any weapon. So1. The Spring Relay is conducted over 4 weeks, starting on the first Sunday in March and ending on the fourth subsequent Sunday. Entries close on the first day of fencing. So2. Weapons eligible to be fenced include foil, classical foil, 1 touch epee, epee, lancet epee, and sabre. Fencers enter to fence a specific weapon, and may enter as many or as few weapons as they desire. So3. All of the fencers entered in the competition in a weapon comprise a pool unique. So4. Fencers fence standard pool bouts against all of the other competitors in the weapon. The number of competitors times 5 establishes a relay total points target, with the exception of 1 Touch Epee and Lancet Epee where the target is 3 times the number of competitors. For example, if 8 fencers enter Epee, the target is 8 times 5 for 40 touches. A special Relay score sheet will be used. So5. Fencers may fence bouts in any order. Bouts may be fenced in open fencing or during the practice fencing periods of any class. So6. If no fencer reaches the relay total points target in the first rotation of the pool, the fencers may repeat rotations until a fencer reaches the relay total points total. However, each fencer must fence all of the fencers in the pool before repeating bouts with other fencers. So7. Each week on Sunday the relay pool will be evaluated, and fencers who have not fenced at least one bout during the week in the weapon will be eliminated from the pool. The only exceptions shall be for illness or unavoidable work travel. The results of bouts against eliminated fencers will be counted for those remaining in the relay. So8. The winner is the fencer who completes the relay point total with the fewest number of bouts fenced. Once a winner is declared, further competition stops, and the remaining fencers are ranked in order based on touches scored. If no one completes the total points the winner is the fencer who achieves the highest score, and second and subsequent placings will be determined by rank order of scores achieved. In the event of a tie in any place, placing will be determined by, in order: (1) bouts won, (2) total bouts fenced, (3) indicators. So9. Medals are awarded for places first through third. Fencers must have fenced at least two thirds of the possible bouts in one rotation to be eligible for a medal. Co1. The Salle Championships is conducted over 4 weeks, starting on the last Sunday in May and ending on the fourth subsequent Sunday. Entries close on the first day of fencing. Co2. Weapons eligible to be fenced include foil, classical foil, 1 touch epee, epee, lancet epee, and sabre. Fencers enter to fence a specific weapon, and may enter as many or as few weapons as they desire. Co3. All of the fencers entered in the competition in a weapon comprise a pool unique. Each fencer may fence any other competitor in any order a single time in open fencing periods or in bouting periods at the end of classes. Each fencer may fence only one bout with each competitor. Results of bouts will be recorded on standard pool score sheets. Co4. The winner in a weapon is the fencer who wins the most bouts. In the event of a tie in any place, placing will be determined by, in order: (1) total bouts fenced, (2) indicators, (3) touches scored. Classical foil placings will be determined by touches received in place of touches scored. Co5. Medals are awarded for places first through third in each weapon. Medals will only be awarded if at least two thirds of the possible bouts in a weapon are fenced. To1. The Salle Team Championships will be held simultaneously with the Salle Championships, under the same basic rules with the following exceptions. To2. Teams will consist of three members: 1 foil fencer, 1 sabre fencer, and 1 epee fencer. Teams may have one alternate for each weapon. To3. Each team will fence every other team in a pool unique of team matches. .A team match will consist of one bout of 5 total touches at Foil, one 1 touch bout of Epee (double touches allowed), and one bout of a total of 5 touches at Sabre. The order of the bouts in each match will be decided by the captain of the team that wins a coin toss. The winner of the match will be the first team to reach a score of 6 touches. In the event of a tie due to a double touch in Epee, a deciding hit will be fenced in the last weapon fenced. T04. Medals are awarded for places first through third in each weapon to all members of a team, including any alternates, that fences all of the matches possible. Uo1. The August Chase is conducted in September as part of and following the annual international Fencing Flashmob. The intent is to provide a fast paced and challenging fun event that will build team spirit and provide a completely different competitive experience to contribute to neuroplasticity development. Uo2. Weapons eligible to be fenced include foil, epee, and sabre. As the event is fenced both outside and inside all fencing will be dry and electric weapons are prohibited in foil and epee. All bouts are self-refereed and fencers are required to immediately acknowledge touches. Uo3. The event will be conducted in two phases. Uo3.1. The first phase will be fenced as the main activity of the Flashmob. Fencers will be divided into pools of 3, to the greatest extent possible with one foil fencer, one epee fencer, and one sabre fencer. To the greatest extent possible teams should be approximately equal in strength. Members of the pool will agree on one weapon to fence, and will fence each other to determine rank in the pool. All bouts will be for the best of 3 touches (the winner may win 2-1 or 3-0 with double touches that would result in more than 3 touches being discarded). Uo3.2. The second phase will be fenced on the fencing floor. Each pool will form a team with one fencer fencing foil, one sabre, and one epee. Teams will fence opposing teams using a standard rotating bout order, with each fencer fencing the team member of the other team who is using the same weapon. All bouts are for the best of three touches. The winner of each team match will be the team winning the most bouts. The required victories may be adjusted based on the number of teams and the available time. Fencing stops when the required number of victories is reach by one team. If no team reaches the victory total by the time all teams have fenced each other, the team with the greatest number of victories is the winning team. Uo5. Medals are awarded to all members of teams placing first through third. The individual results of fencers in the outside intrapool competition and the inside team matches will determine places 1st through 10th for ribbon awards. Ao1. The Salle Anniversary Tournament is conducted in December, starting on the 1st and ending on the 31st of the month. Entries close on the first day of fencing. Ao2. Weapons eligible to be fenced include foil, classical foil, 1 touch epee, epee, lancet epee, and sabre. Fencers enter to fence a specific weapon, and may enter as many or as few weapons as they desire. Ao3. All of the fencers entered in the competition in a weapon comprise a pool unique. Each fencer may fence any other competitor in any order a single time in open fencing periods or in bouting periods at the end of classes. Each fencer may fence only one bout with each competitor. Results of bouts will be recorded on standard pool score sheets. Ao4. The winner in a weapon is the fencer who wins the most bouts. In the event of a tie in any place, placing will be determined by, in order: (1) total bouts fenced, (2) indicators, (3) touches scored. Classical foil placings will be determined by touches received in place of touches scored. Ao5. Medals are awarded for places first through third in each weapon. Medals will only be awarded if at least two thirds of the possible bouts in a weapon are fenced.